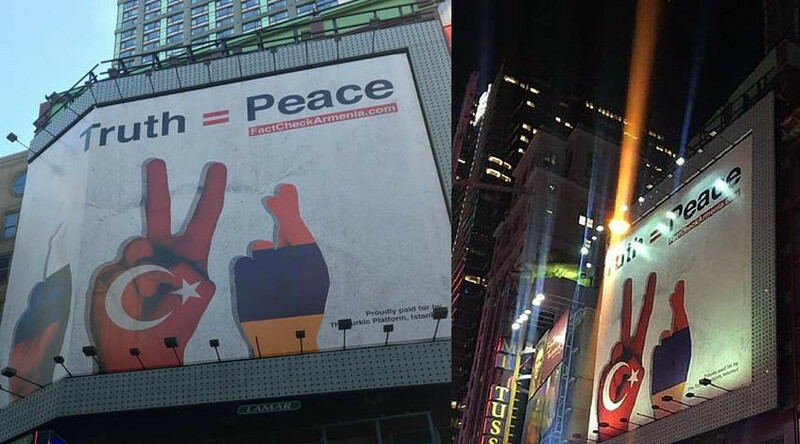 The ad features the words “Truth=Peace” printed in large letters and shows a hand colored like the Turkish flag holding up a peace sign, while two other hands colored like the Russian and Armenian flags have their fingers crossed. It also contains a link to the genocide-denial group FactCheckArmenia.com, which propagates claims that Armenians were killed during the First World War because they were “collectively guilty” of treason against the Ottoman Empire. Moreover, it attempts to argue that fewer people were killed than is claimed, and that the Armenians started the conflict. The WSJ ad caused outrage on Twitter and other social media platforms. @Gary__Bass@WSJ Shame on you WSJ!! @Gary__Bass@WSJ It was what it was. 1.5 Million full-page ads denying it won't change it into anything else. @Gary__Bass@WSJ Officially canceled my subscription. Adding to the controversy, the newspaper responded by saying it prints many “provocative” ads that may not represent the opinions of WSJ. “We accept a wide range of advertisements, including those with provocative viewpoints. While we review ad copy for issues of taste, the varied and divergent views expressed belong to the advertisers,” the paper's spokesperson said, as quoted by Gawker. This is ridiculous: An Armenian Genocide denial billboard in Times Square (hosted by @iHeartMedia). The group that paid for the ad promotes a pro-Turkey platform, with the goal of deflecting attention from the facts surrounding the genocide. It appears that the latest campaign, which comes on the eve of the 101st anniversary of the Armenian genocide, has been well-coordinated and sponsored. The group was able to place similar ads in Boston and New York’s Times Square. While it took less than a day of Twitter outrage to have the Boston ad removed, it remains unclear for how long the huge banner in Times Square had been up. Beginning in April of 1915, most of the Ottoman Empire’s Armenians were killed, displaced, deported or placed in concentration camps, ostensibly for rebelling and siding with the Russians in World War I. Turkey admits that many Armenians were mistreated, but asserts that the exact numbers of those killed have been exaggerated, and there had been no systematic policy to eliminate the Armenian minority.